The Medieval Chemise and Skirt Set is an inspired take on historic style, handmade from 100% natural cotton. This two color outfit consists of a blouse length chemise and skirt, featuring a built-in pouch at its belted waist. This pouch matches the contrasting trim along the round neck and flared long sleeves as well as the apron panel on the front of the skirt. 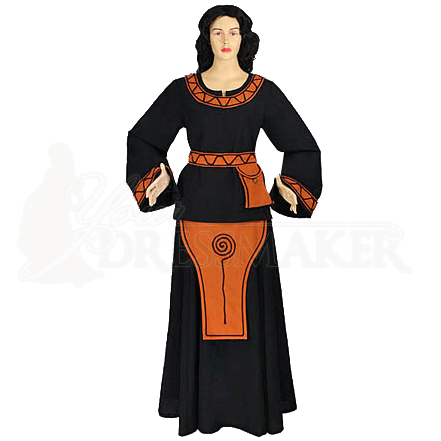 Ideal for standing out at your next historic reenactment event, medieval festival, or LARP gathering, the Medieval Chemise and Skirt Set is available in a variety of color combinations to suit your historic style. When ordering, the first Color dropdown menu is for the main color. The Accent Color is for the apron and trim pieces.